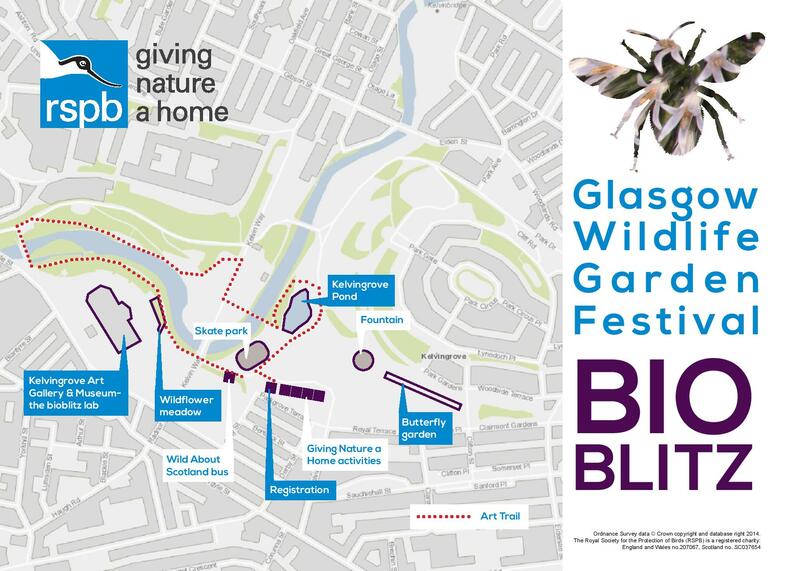 Giving Nature a Home in Glasgow Full schedule for Sunday's bioblitz in Kelvingrove Park! 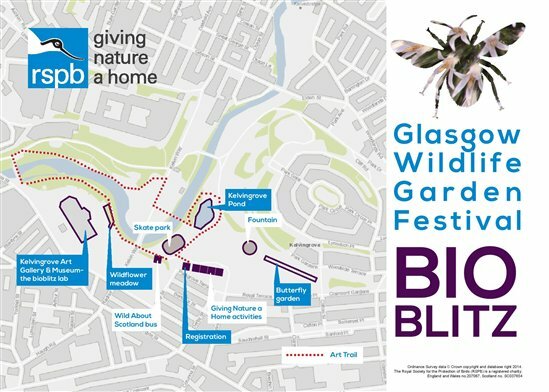 It’s the great Glasgow bioblitz this Sunday, and we’re aiming to discover everything that grows, flutters, squawks, squeaks, crawls, runs, flies or swims in this city! We’d love you to take part in your garden or a park near where you live. Just download the pack that you’ll find at the end of this blog, fill it in, and either send it to us, or bring it along to Kelvingrove Park this Sunday. The first 20 people to bring along a filled in bioblitz sheet on the day will receive a free nest box! But there’s also plenty to join in with in Kelvingrove Park, with loads of experts around to identify everything that’s found, and fun activities running throughout the day. In fact, there’s so much happening, we thought it might be useful to give you a list! For all bookings, and any additional info contact gnahg@rspb.org.uk. Unless it says otherwise, activities start at the Registration Marquee (which will be near the skate park) and will last about an hour. 8am The day kicks off with an early bird walk. First thing in the morning is a great time to see birds, and to hear any that are singing. Booking is required for this one. Meet at the seating area at the back of Kelvingrove Museum (next to the car park). 9am Our stalls will all be set up and ready to go near the skate park, so come along and take part in activities, like crafts, seedbomb making and face painting. If you have any wildlife questions, or want help with carrying out your survey, there will be loads of experts on hand from organisations like Froglife and Buglife. The stalls will be open until 4pm. 10am Buglife will be running the first walk of the day! 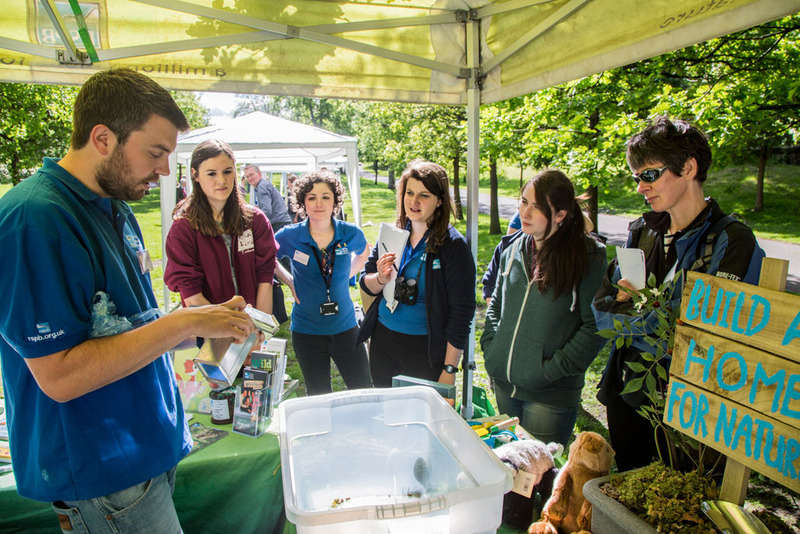 Find out about all the invertebrates that live in Kelvingrove Park. 10am If you prefer birds to bugs, the RSPB Scotland team will also be leading a bird walk around Kelvingrove Park. 10am Tweeting Toddlers, for families with children aged 1-4. Lots of animal-themed songs, stories and activities. 11am Our bioblitz lab will open in Education Suite 1, downstairs at Kelvingrove Museum (just ask at the information desk). On hand will be members of Glasgow Natural History Society, who’ll be identifying any wildlife that’s brought in. The RSPB Scotland education team will also be there, and we’re running an insect photo booth! Runs until 4pm. 11am In Education Suite 2 in the KG Museum, we’ll be running bioblitz crafts for kids with the help of staff from the museum. This will also be open until 4pm. 11am Bushcraft fun with RSPB Scotland. Learn some practical tips on how to survive in the wild, and try your hand at den-building. Good for families. 11.30am The Bumblebee Conservation Society will be leading a bumblebee walk around the park. Loads of species to be found! This runs until 12pm. 2pm RSPB Scotland will be leading a bushcraft session on tracks and signs. Sometimes you don’t even need to see wildlife to know what’s around! Good for families. 3pm FORK will be running another kick sampling session until 3.30pm (see above for details). 3pm Minibeasts with RSPB Scotland. Perfect for introducing kids to all the bugs and beasties in the park! 9pm ...but the day is not over!! If you missed all the fun, or you want more, come along and join us on our bat and moth walk. We’ll be using bat detectors and moth trapping to discover all the creatures of the night! This runs until 11pm. Remember that all these events, apart from the ones in the museum, are outside, so dress for our lovely Scottish summer weather! Events may be subject to change on the day, mostly due to weather conditions, but we’ll try to keep everything running on time, and if anything has to be cancelled, there will be other activities to take part in. We’ll also be encouraging people to do their own bioblitz in the park, and we’ll have ID packs to give out on the day. Everyone who hands their completed survey in to us at the Registration Marquee by 3.30pm on Sunday, whether they’ve filled it in at home or in the park, will be entered into a prize draw. There’s a prize for adults of a yummy bag of RSPB Love Nature produce, including chocolate, coffee and fudge, and a prize draw for all entries aged 16 or under, who’ll be able to win a frog and toad habitat for the garden, plus a bug hunting kit. We’ll also have a prize of a nature book and a nest box, for the entry with the most species discovered in Kelvingrove Park on the day. The prize winners will be announced and prizes will be handed out at the registration marquee at 3.45pm. Please see the T&Cs below. I think that’s everything, but we’ll be putting updates out on the day through Twitter @RSPBGlasgow, and you can tweet us any questions or any species you can’t identify. Please use #GlasgowWildFest. You can download you own bioblitz pack from the very bottom of the blog, and please do remember to respect and not unduly disturb any wildlife while you're carrying out your survey! Hope to see you at Kelvingrove Park on Sunday. Terms and conditions of the competitions. 2) Any entry which is incomplete, illegible or late will be deemed invalid in the sole discretion of the RSPB. 3) There is no cash alternative to the competition prizes. 4) Only one entry is allowed per person. 5) The first 20 completed entries that are handed in will receive a nest box to take away (assembly required). 6) All entrants over 16 will be put into a prize draw, and one winner drawn at random. 7) All entrants 16 or under will be put into a separate prize draw and one winner drawn at random. 8) The entry sheet with the most species noted from Kelvingrove Park, taken from all age categories, will also be awarded a prize. In the event of a draw, the winner will be selected at random. 9) Winners will be announced at 3.45pm at the Registration Marquee in Kelvingrove Park. Any winner who is not able to collect their prize at this time will be contacted by phone, and must pick up their prize from the RSPB office at 10 Park Quadrant, Glasgow, G3 6BS from Monday – Friday 9am-5.15pm. 10) Any winner who has not responded to notification within 21 days will forfeit their prize; a replacement winner will be selected from other entrants. 11) RSPB Scotland’s decision on all matters affecting this competition is final and legally binding. No correspondence regarding the results of the draw will be entered into. 12) Any RSPB employee or anyone directly connected with the organisation or their immediate family will be ineligible to enter. 13) All entrants will not harm, put at risk or unduly disturb any wildlife or habitats when taking part in this survey. 14) If you are under 18 years old you must have parental or guardian consent before entering the competition. 15) This competition is governed by Scots law.